Had I not seen the speed test results myself I might not have believed them. But there we were, 36,000 feet above the North Carolina-Virginia border flying at 500 miles/hour and the numbers were clear as day: 22mbit download! Yeah, that’s damn fast. Welcome to Fly-Fi, the new in-flight internet service offered by JetBlue. Yes, that’s for real: 22mbit download speeds in the sky! This week passengers on a select few JetBlue flights are getting the first opportunity to try out the new Fly-Fi service; I was fortunate that my flight on Monday evening had the connectivity online and, for the most part, working well. It was not 100% perfect all the time, but when it was “on” it was, by far, the best online experience I’ve had in the sky. The wireless network was available while still parked at the gate but there was no actual connectivity at that point. Almost immediately after clearing 10,000 feet the network kicked in, sortof. Of my three devices one was online immediately while the other two remained offline. Clearly they mean it when they say the service is in beta testing right now. There is some on-board content, including destination information and the moving map. The flight wasn’t really 26 hours so obviously a few bugs there but the data available was pretty cool. There were six JetBlue employees (plus representatives from LiveTV and ViaSat on-board the flight helping support users and working with passengers to make sure that everything worked smoothly. After a quick reboot of the system things started working pretty well. I was able to load videos off of YouTube, stream Hulu for a bit and otherwise use resources online more or less like I was at home. I say more or less because, as expected, the performance was not a completely smooth usage profile. 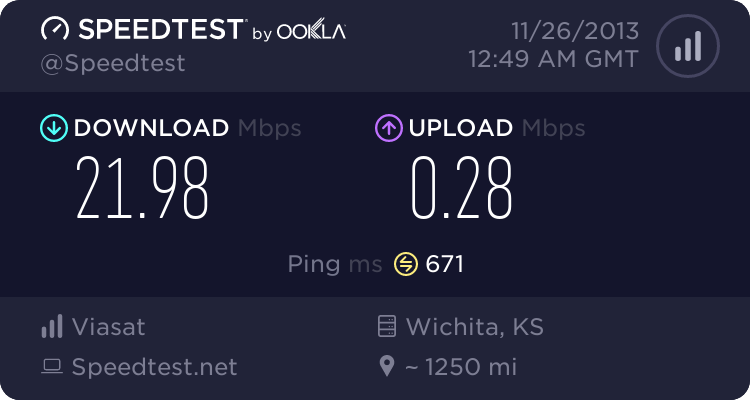 There were times when the streaming would need to buffer and times when the overall speed numbers were lower than the peak levels I got early in the flight. I worked around it without any issues but it is interesting to see that they are limiting usage to one device per passenger email address (easy enough to work around, depending on what email system you use) at this point. There was, as promised, free service available and also a paid version promising higher speeds. 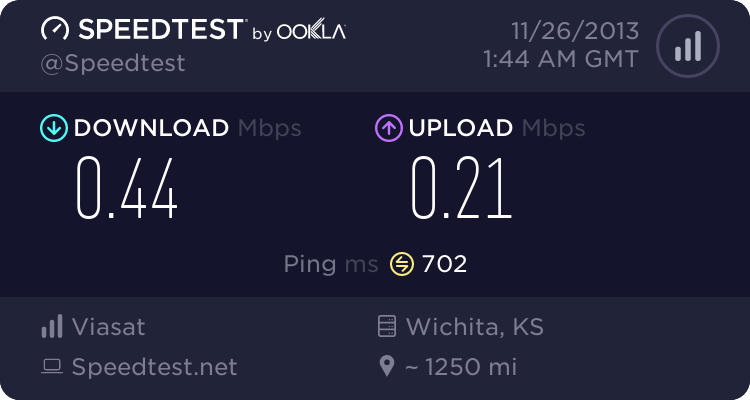 In speaking with one of the JetBlue employees on board about the faster speed service he noted that it was more about prioritizing certain types of traffic such as streaming, not about getting faster downloads than the 22mbit numbers; that’s the peak throughput for the entire plane. I didn’t have time to try the paid option during my tests; hopefully I can do that in a couple weeks when I’m back on board another flight with the service. I didn’t try the $9/hour plan this time, but I mostly didn’t need it. 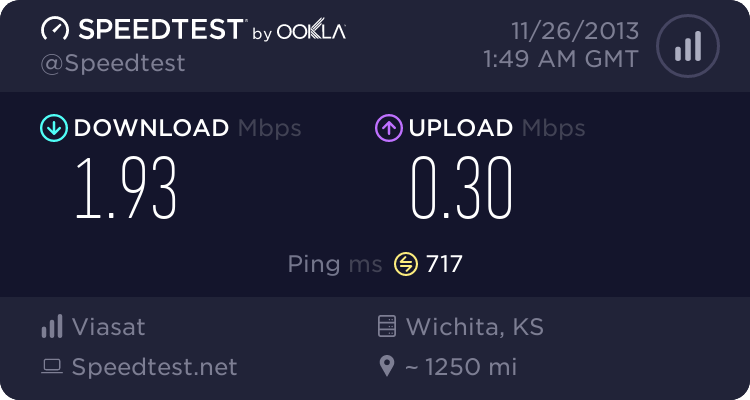 The upload speeds remained reasonably consistent throughout the flight and, as you can see from the speed test results, they aren’t spectacular. They are, however, in line with what satellite service typically provides. I worked via remote desktop on a couple different servers on the ground, sent emails, posted to Twitter and Facebook and the performance of those functions was about as expected. I didn’t try to upload a video to YouTube or email huge attachments, mostly because I know that it wouldn’t be a great experience. Given that most usage is download anyways I’d say that the asymmetric approach is going to be OK for now. Finally, as part of my testing I loaded up a handful of pages both on the ground in the terminal (JFK T5) using the free WiFi there and then again on the plane to compare the page load speeds. Obviously only a single set of numbers for each page so not enough to be authoritative but it is a pretty interesting comparison overall. When it was online the system is fast. Web pages loaded quickly and the end-user experience was, for the most part, very similar to being on the ground. It will not be 12mbit of connectivity to every user – that bit of marketing puffery has been debunked already – but the overall experience even with 42 active devices was very, very good most of the time. It is not perfect, yet. There is still work to be done before they can truly claim the overall fastest in-flight internet experience. But it is damn close and getting closer each day. Zach from engadget was on the JFK-AUS-JFK flights earlier in the day and seems to have had similar experiences. This is the same kit United will have on the 737s soon enough. The STC is issued so it is just a matter of LiveTV being happy enough with the system that they’ll deploy it for real.